Directions: From I-25, take the Exit 75 toward Truth or Consequences, follow the main street into Broadway, then to Riverside Dr. At Austin Ave, turn right, go all the way til the end of road. Riverbend Hot Spring is on the right side of the road. Here is the place my family like to spend our winter days at least once a year. 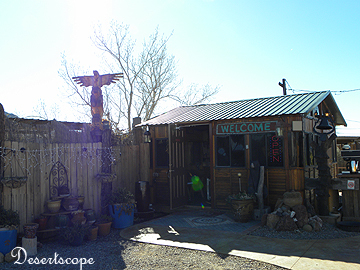 The place is about a hour drive from Cruces and offers a little getaway from the fast and stressful life style. Because its closeness to Elephant’s Butte State Park, the area is normally more crowded during summer. 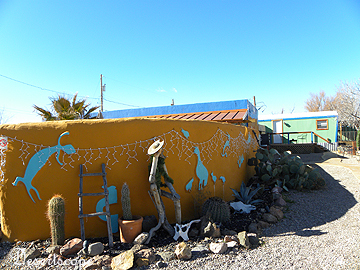 At winters, the place mellows down, and the biggest attraction becomes the natural hot springs. There are several other bath houses in the area: Marshall Hot Spring, Charles Motel and Bath House, Firewater Lodge, Hay-Yo-Kay, etc. I like Riverbend because it is open to the air and each one of its hot tubes has the view of the Rio Grande River as it curves around right underneath the deck. On the other side of the river was a large patch of green valley that rolls toward the Turtleback Mountain. It is here whether or not if you are a Riverbend guest, for a small fee, you may jump into any one of the three five pools that are vary in temperature, or you may make a reservation for one of the three private pools. Each one of the three private pool has its own wooded tall fence for privacy and a door that you could lock it from inside. 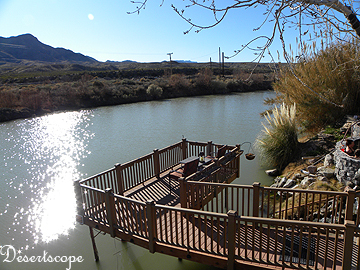 Each pool has its own deck that overlooks the Rio Grande, and its own setting areas (beach chairs, rock benches, etc). The clean hot water is constantly been pumped into the tub. In a cold winter day, the water is both soothing and packed with minerals. I often found my body restore to its softness and temporarily escape from its crusty dry shell. The hosts are courteous and there are rules for the tubs, which explain why each one of the pool is always nice and clean.